During the summer, I worked at the Cotuit Center for the Arts as a stage manager, light board operator and sound board operator. 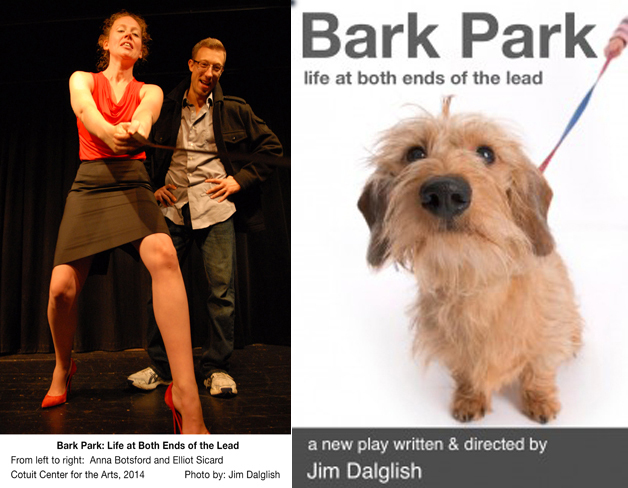 Around mid-July, I auditioned for a show at Cotuit entitled “Bark Park”. The play consisted of two one acts and were both original pieces. The writer and director, Jim Dalglish, casted me as both Mike (a middle aged man living in New York) and Jimmy (a miniature wired-haired dachshund). The cast consisted of only three people. One of the actors was in New York on business and wouldn’t be physically at rehearsals until August! We somehow made it work by using Skype and social networking. My cast mates, Anne and Tony, were very professional and friendly. Jim’s directorial style was one that I greatly admired. We read through the play multiple times and had lengthy discussions about our characters. It was encouraged that we all develop our own theories and backgrounds for our characters. It was a highly collaborative process, which is what I enjoyed the most. The show quickly sold out and we even added an additional show due to popular demand. Before “Bark Park” it had been close to two years since I had performed on the stage so it was nice being in front of an audience again.